The average combined federal, state, and local top marginal tax rate on long-term capital gains in the United States is 28.6 percent – 6th highest in the OECD. This is more than 10 percentage points higher than the simple average across industrialized nations of 18.4 percent, and 5 percentage points higher than the weighted average. Nine industrialized countries exempt long-term capital gains from taxation. California has the 3rd highest top marginal capital gains tax rate in the industrialized world at 33 percent. The taxation of capital gains places a double-tax on corporate income, increases the cost of capital, and reduces investment in the economy. 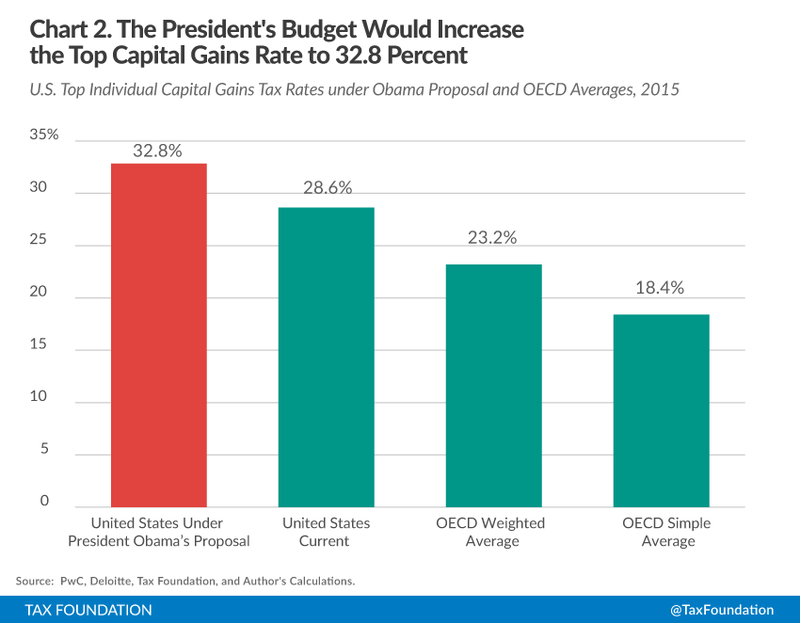 The President’s FY 2016 budget would increase capital gains tax rates in the United States from 28.6 percent to 32.8, the 5th highest rate in the OECD. Saving is important to an economy. It leads to higher levels of investment, a larger capital stock, increased worker productivity and wages, and faster economic growth. However, the United States places a heavy tax burden on saving and investment. One way it does this is through a high top marginal tax rate on capital gains. Currently, the United States’ top marginal tax rate on long-term capital gains income is 23.8 percent. In addition, taxpayers face state and local capital gains tax rates between zero and 13.3 percent. As a result, the average combined top marginal tax rate in the United States is 28.6 percent. This rate exceeds the average top capital gains tax rate of 23.2 percent faced by taxpayers throughout the industrialized world. Furthermore, taxpayers in some states face top tax rates of over 30 percent on capital gains, which is higher than the rates in most industrialized countries. The recent tax plan released by President Obama would increase the average top marginal income tax rate on capital gains in the United States from 28.6 percent to 32.8, which would be the 5th highest in the industrialized world. The current federal top marginal tax rate on long-term capital gains in the United States is a total of 23.8 percent (20 percent plus a 3.8 percent tax to fund the Affordable Care Act) for taxpayers with adjusted gross incomes of $200,000 ($250,000 married filing jointly) or more. In addition, states and some localities levy taxes on capital gains income, which range from zero percent in states with no individual income tax, such as Florida, Texas, South Dakota, and Wyoming, to 13.3 percent in California (See Table 1). An individual who has capital gains income is subject to both federal and state capital gains taxes. Taking into account the federal deductibility of state taxes and the phase-out of itemized deductions, top marginal tax rates on capital gains range from 25 percent in the nine states that do not levy a tax on personal income to 33 percent in California. The average across the United States is 28.6 percent. The United States’ average top marginal tax rate on capital gains of 28.6 percent is the 6th highest rate in the OECD and is more than 10 percentage points higher than the simple average of 18.4 percent across the 34 countries (Table 2). The highest tax rate on capital gains is 42 percent in Denmark. Nine OECD countries do not tax capital gains. Taxpayers in many states face much higher marginal tax rates on capital gains than taxpayers in most OECD countries (Table 3). Comparing U.S. states with individual countries in the OECD, U.S. states have seven of the top ten capital gains tax rates in the OECD. California, with a top rate of 33 percent, has the third highest capital gains tax rate in the industrialized world. Even taxpayers in states without taxes on capital gains face top rates higher than the OECD average. Capital gains taxes represent an additional tax on a dollar of income that has already been taxed multiple times. For example, take an individual who earns a wage and decides to save by purchasing stock. First, when he earns his wage, it is subject to income taxes at the state and federal levels. He then purchases stock and lets his investment grow. However, that growth is smaller than it otherwise would have been due to the corporate income tax on the profits of the corporation in which he invested. After ten years, he decides to sell the stock and realize his capital gains. At this point, the gains (the difference between the value of the stock at purchase and the value at sale) are taxed once more by the capital gains tax. The effective capital gains tax rate could be even higher after accounting for inflation; a significant difference in the value of the stock may be from inflation, not real gains. These multiple layers of taxation encourage present consumption over saving. Suppose someone makes $1,000, and it is first taxed at 20 percent through the income tax. This person now has a choice. He can either spend it all today or save it in stocks or bonds and spend it later. If he spends it today and buys a television, he would pay a state or local sales tax. However, if he decides to save it, delaying consumption, he is subject to the multiple layers of taxation discussed previously plus the sales tax when he eventually purchases the television. This lowers the potential rate of return on an investment, which discourages saving. An individual can avoid the multiple layers of taxation on the same dollar if they spend the dollar now instead of later. As more people prefer consumption today due to the tax bias against saving, there will be less capital available in the future. For investors, this represents less available capital for factories, machines, and other investment opportunities. Additionally, capital gains taxes create a lock-in effect that reduces the mobility of capital. People are less willing to realize capital gains from one investment in order to move to another when they face a tax on their returns. Funds will be slower to move to better investments, further reducing economic growth. President Obama released his FY 2016 budget, which had a series of tax changes. Among these changes was an increase in the federal top marginal capital gains tax rate from 23.8 percent to 28 percent. Combined with state and local income taxes on capital gains, the average top marginal capital gains tax rate would increase to 32.8 percent. California’s top marginal tax rate would increase from 33 percent to 37.2 percent. Taxpayers in states with no income taxes would still face a top rate of 29.2 percent, a higher marginal rate than what taxpayers face in all OECD countries except for Denmark, France, Finland, Ireland, and Sweden. The United States currently places a heavy tax burden on saving and investment with its capital gains tax. The U.S.’s top marginal tax rate on capital gains, combined with state rates, far exceeds the average rates faced throughout the industrialized world. Increasing taxes on capital income, as suggested in the president’s recent budget proposal, would further the bias against saving, leading to lower levels of investment and slower economic growth. Lowering taxes on capital gains would have the reverse effect, increasing investment and leading to greater economic growth. Source: Tax Foundation, Commerce Clearing House, and Author’s Calculations. * States either allow a taxpayer to deduct their federal taxes from your state taxable income, have local income taxes, or have special tax treatment of capital gains income. Source: Ernst and Young and Deloitte Tax Foundation Calculations. Source: Ernst and Young, Deloitte, Tax Foundation, and Author’s Calculations. Assets held for more than one year. Most states tax capital gains as ordinary income. Tax Foundation, Facts and Figures 2014: How Does Your State Compare? (Mar. 2014), https://taxfoundation.org/article/facts-figures-2014-how-does-your-state-compare. See also Commerce Clearing House Intelliconnect Database. The Pease limitation on Itemized Deductions reduces many deductions by 3 percent for taxpayers with adjusted gross income exceeding $250,000 ($300,000 married filing jointly). The U.S. average is the combined federal, state and local rates on capital gains, taking into account Pease Limitation and state/federal deductibility of income taxes weighted by capital gains income in each state. Capital gains income data from Internal Revenue Service, Statistics on Income, Historic Table 2, http://www.irs.gov/uac/SOI-Tax-Stats—Historic-Table-2. Ernst & Young, 2013-2014 Worldwide Personal Tax Guide, http://www.ey.com/GL/en/Services/Tax/The-worldwide-personal-tax-guide—Country-list. See also Deloitte, Deloitte International Tax Source, Country Guides and Highlights, https://www.dits.deloitte.com/Administration/ManageHomePage/Popup.aspx?ChildPage=Country%20Guides%20and%20Highlights. Given that certain requirements are met. 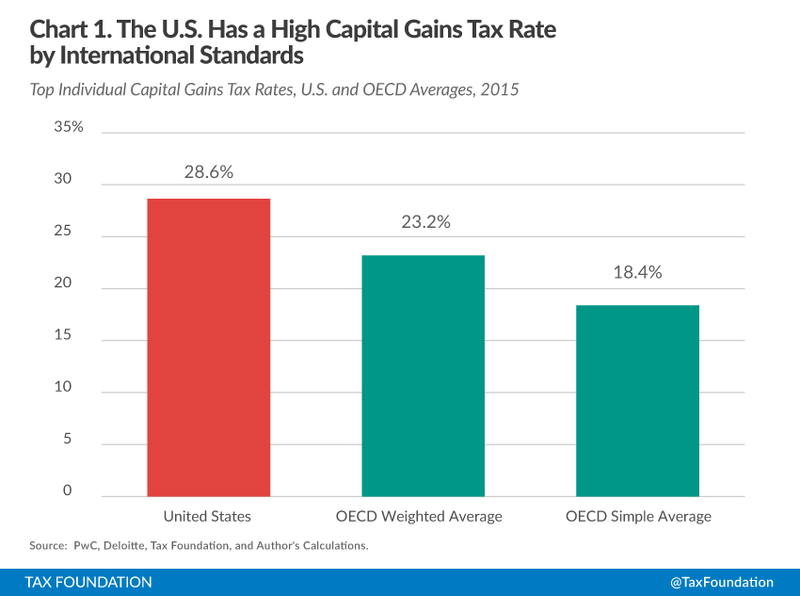 For an explanation of integrated tax rates on capital gains, see Robert Carroll & Gerald Prante, Corporate Dividend and Capital Gains Taxation: A comparison of the United States to other developed nations, Ernst & Young LLP (Feb. 2012), http://images.politico.com/global/2012/02/120208_asidividend.html. John L. Aldridge and Kyle Pomerleau, Inflation Can Cause an Infinite Effective Tax Rate on Capital Gains, Tax Foundation Fiscal Fact No. 406, https://taxfoundation.org/article/inflation-can-cause-infinite-effective-tax-rate-capital-gains. 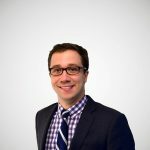 Andrew Lundeen, Proposed Tax Changes in President Obama’s Fiscal Year 2016 Budget, Tax Foundation Tax Policy Blog (Feb. 11, 2015), https://taxfoundation.org/blog/proposed-tax-changes-president-obama-s-fiscal-year-2016-budget. A top rate of 24.2 plus the 3.8 percent Net Investment Income Tax.